The Macan helped Porsche sales rise nearly a fifth in 2015. 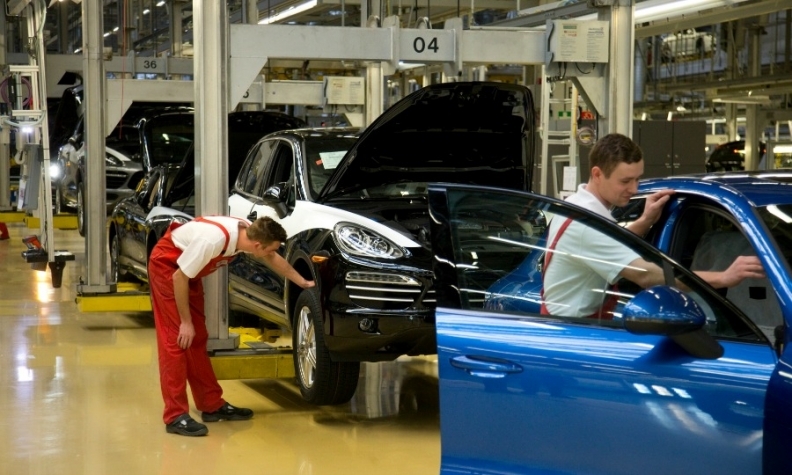 Pictured is Macan production in Leipzig, Germany. BERLIN (Reuters) -- Porsche said it would pay workers a higher bonus for 2015 despite the emissions scandal at parent Volkswagen Group that has sparked cost reductions across the group. Porsche, the second-biggest contributor to group profit among Volkswagen's brands, will pay almost 20,000 staff at plants in the German cities of Stuttgart and Leipzig a bonus of up to 8,911 euros ($9,881) each, up from 8,600 euros a year earlier, the company said on Wednesday. Porsche CEO Oliver Blume said workers deserved the higher payout for helping the sports-car maker "achieve an exceptional result in an environment that was anything but easy." Porsche's vehicle sales jumped almost a fifth to a record 225,121 cars in 2015, helped by the first full year of deliveries of the Macan compact SUV. The increase helped to boost operating profit by a quarter to 3.4 billion euros. VW is accelerating a cost-savings program at its core VW brand and has earmarked about 3,000 office jobs to be cut in Germany as it struggles to cover the costs of its emissions scandal. Top executives and labor leaders at VW brand have agreed that staff on in-house contracts should be rewarded with a bonus for 2015, but the amount is expected to be lower than the previous year's 5,900 euros each. Earlier this month, VW's luxury division Audi said it would pay workers at its German plants in Ingolstadt and Neckarsulm a bonus of 5,420 euros each on average, down from 6,540 euros for 2014.